I've been putting off reviewing this beer for a few years now.. I have no idea when I purchased this beer, likely back in 2016 but I feel like it was longer ago. I remember it was something like $20 when I bought it at the time, so I had lots of anxiety to review this beer.. so I've put it off until now. Central City's Sour No. 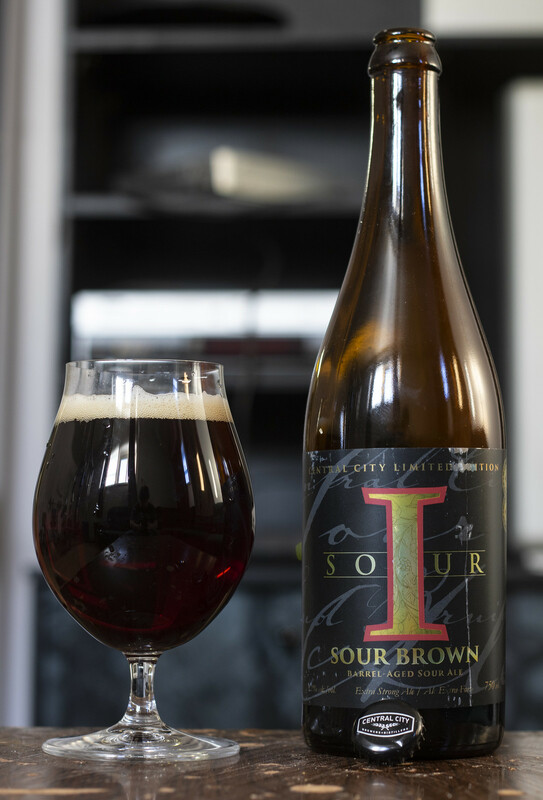 1 Sour Brown is described as "A complex sour brown ale that balances sour notes with a melodic malt character. Aged for 2 years in a combination of Cabernet Sauvignon barrels and French oak foeders, this medium bodied sour brown ale was created in the traditional Belgian fashion." I'm not typically a fan of sours but once in a while I get the urge to have one, and the urge happened today! Appearance: Pours a dark brown with a slight amount of a clarity to it and a ruby red hue. The head on the beer is perfect, gives off a full finger's worth of beige head on top, with a hint of crackling from the bubbles that disappear. I was fully expecting this to be a gusher, but thankfully it was well behaved! Aroma: Just by smelling it, I wouldn't be able to tell if this is 3+ years old, it smells like I just bought this at a reputable beer store yesterday. The first thing I get is that it's really, really sour. Like.. it has a bit of that red wine vinegar sourness that some people absolutely love while many others dislike. There's also notes of dark fruit (raisins, plums), a rich oakiness, and and a rich wine sweetness. Taste: Very sour and quite dry - There's notes of Cabernet Sauvignon right at the beginning that gives off a rich, wine texture with a tad bit of sweetness, a rich oak presence that lingers for a bit but not for too long, a good deal of sweet fruit presence where I'm getting a bit of cassis (black currant), a bit of various wine grapes, and a dark fruitiness of raisins. The red wine vinegar presence is there when it's colder, but once it warms up a bit, it's definitely mellowed a bit, so the beer is tasting bit sweeter but still has a bit of that Flanders vibe to it still. The aftertaste is a light tartness that reminds me of Cab Sauv. Overall Thoughts: A very very good Sour.. and I think it may be worth the $20 price point when I bought it way back when. Unfortunately I don't have another bottle of this aging so I won't get to experience this beer again but in reality the beer would eventually get stale in the hoard anyways. It's got a lot of complexity to it - some red wine vinegar for aroma, dark fruits, good amount of oakiness, as well as a nice fruity sweetness once it warms up. With the temperature being below -30C right now, seeing that this is 9.2% ABV, this will warm up just about anyone!